So many fun things happened this week. 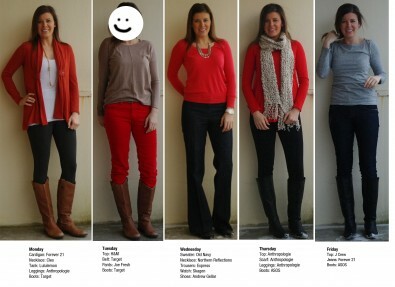 First up I’ll post my outfits that I wore to work this week. That’s a lot of red going on. 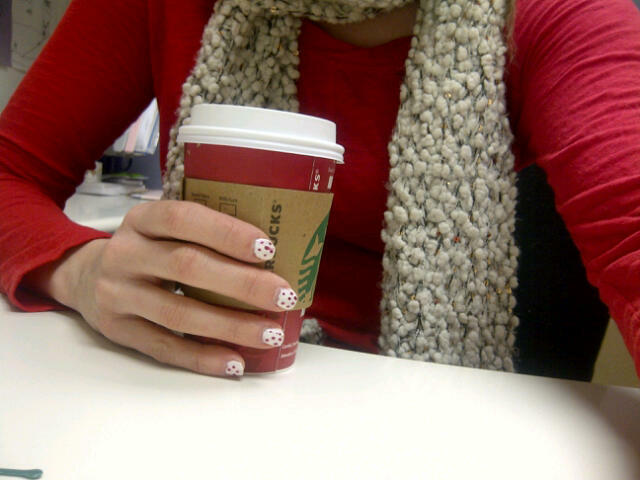 Guess I’m subconsciously feeling festive? It’s pretty windy outside this morning, hence the face. Secondly let’s talk about food. Holy guacamole my work is amazing. We had two sponsored lunches this week. 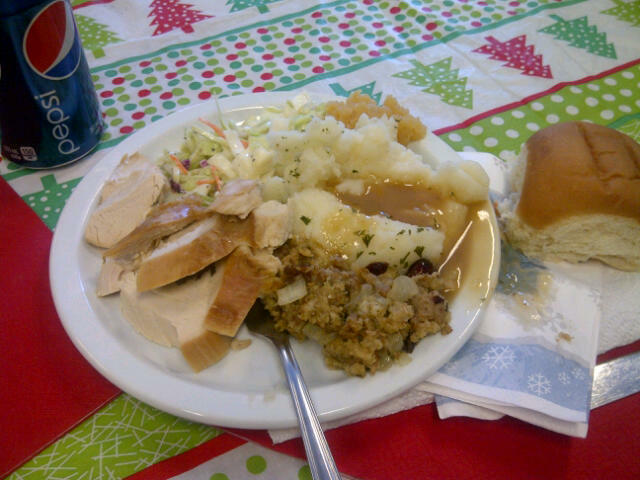 Monday we had pizza and yesterday we had TURKEY DINNER. Crazy right. I am the messiest eater ever. Where’s my bib? Pepsi flung down my shirt (I don’t even know myself), and gravy strewn everywhere. It’s a common phrase that people use on me on almost a weekly basis: “Nancy, we can dress ya up but we can’t take you out.” I will admit that is 100% true..
Also have been drinking some Starbucks peppermint white mocha’s. #PeppyMoXo on twitter…catchy name. Not only that… McDonalds made me McSmile (cue the cheese… burger) with a Christmas gift filled with all sorts of treats. I posted it on Facebook and Twitter thanking them for the presents. I don’t really know why they sent it to me, other than the fact that they tell me I’m their biggest fan. I can’t believe I’m noticed. Maybe that means I eat there too much. 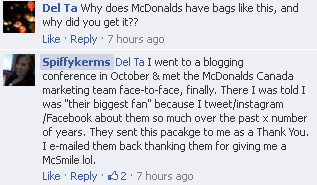 The bag contained 2 McCafe mugs, a pkg of coffee, and some coupons for fries, wraps, drinks and burgers. When I opened the superbly large box it came in, I literally did a hysterical laugh. 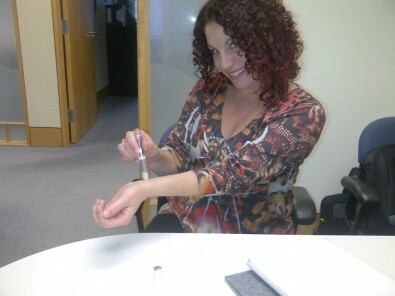 No joke, it sounded manic and two of my coworkers came running into my office to see what the commotion was all about. Then I started dancing and twirling with my new “purse”. My fav co-worker Julie and I enjoyed the rollerball perfume (Philosophy Living Grace!) that Leanne gave me. This is why WestJet is my favourite airline in Canada. So glad things like this happen in real life. I dear you not to be touched after watching it. … and on the flip side I am so glad that stuff like Hunger Games doesn’t happen in real life. I watched the Catching Fire with the Boyfriend last Friday. It was insane, Who here has watched it? Jennifer Lawrence is one heckuva actress. Taking selfies on Instagram with my front facing camera on the iPad. It made me giggle like a little child. I squish my head…doot de doo. Side note I still use my Nexus 7 tablet. I alternate days on using them. Hard life. My white feathery Christmas tree and Christmas music from internet radio stations. I’ve been in a chipper mood ever since December 1st. I LOVE SANTAAAA. Yes that is definitely a Starbucks miniature cup (gift card) hanging on the tree. Cute huh? 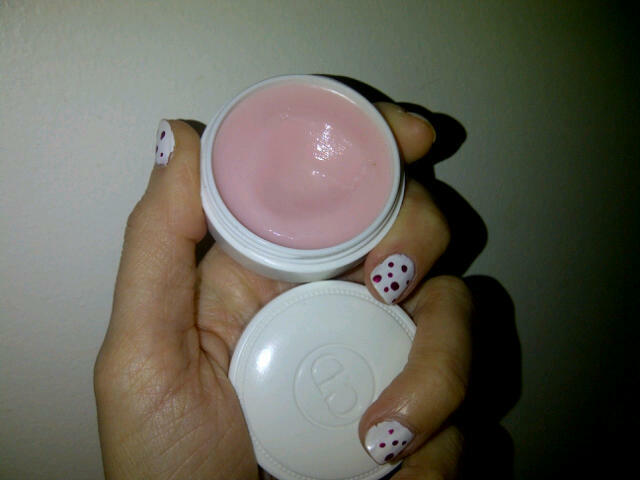 I have been digging to China with this new Dior lip balm I picked up for myself with the Sephora VIB sale a few weeks back (see what I bought). I can’t stop applying it to my lips. It gives the faintest light pink colour to the lips, but it’s so nourishing that when I feel it wear off I need to apply ASAP. I need to slow down on how much I apply it, it’s expensive. Philosophy surprised me with an early Christmas present. I feel very lucky. 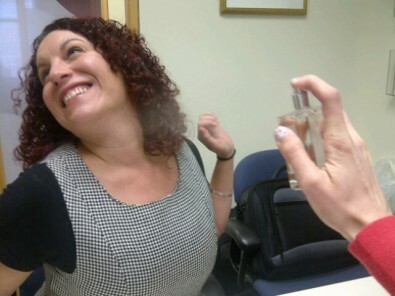 I even shared the wealth with Julie and sprayed her continuously this week with perfume. See the mist? Our offices smelled great this week. Just sayin’. 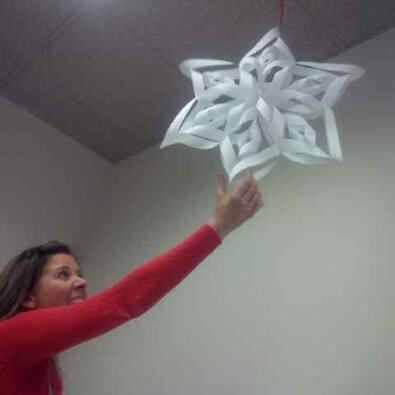 In return of spraying my new perfume on Julie all week long, I stole her fancy snowflake. It’s pretty magnificent, I mean – who wouldn’t want a few of these in their office? Gimmie. I’m now set for about 3 months. Just kidding, I don’t spray myself every hour with the perfume. But it’s pretty close. I’d say it’ll last a good year ;) Plus I still carry around the rollerball (in the same scent) that Leanne gave to me for Christmas. 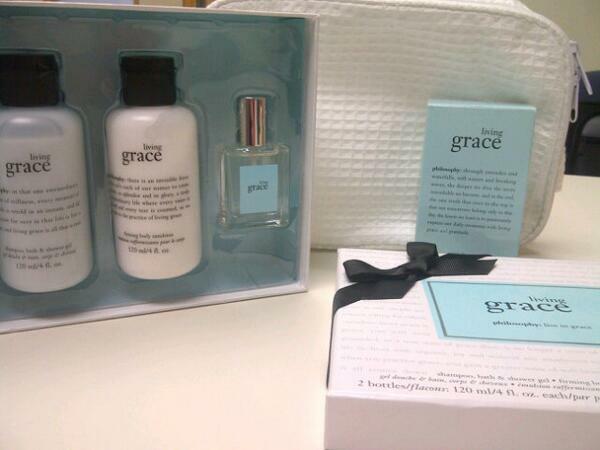 As they say “Omg I’m so in love with this scent”. I wouldn’t say in love, because that’s just weird wording. I would say it’s my signature scent. Not one of my favourite scents is a Marc Jacobs perfume. 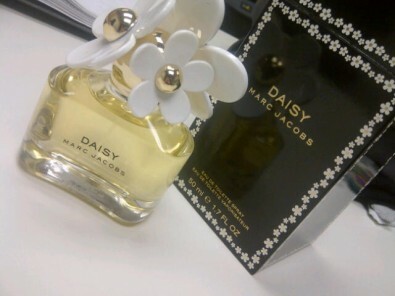 It’s called Daisy but it smells like palmolive dish soap to me! What are some of your favourite things from this week? Top moments for me was the McDonalds and Philosophy gifts! What is everyone’s plans for the weekend? I’m going to give Alfie a bath with The Guy’s help. He’s easy to bathe but I like having The Guy in the bathroom with me to talk to Alfie as I clean him. It sounds weird, but The Guy calms him down unlike me who gets straight to work and forget to calm/talk Alfie through it, hahaha. Stressful times for the dog. You know you eat a lot of McDonald’s when… haha. Speaking of which, McDonald’s has poutine now, have you tried it? I had poutine at lunch today with coworkers and they told me about it. I also bet every non-Canadian is scratching their heads at poutine. HOLY CRAP. What a week, girl. P.s I want a big mac. @Kyla @ Mommy’s Weird: I got the coupons, let’s go eat!